Before you complete your online entry please read the following carefully. 1. This race is organised by Torbay Holiday Helpers Network and none of our staff, committee sponsors, suppliers or agents will be liable for any injury, loss or expense which may arise as a consequence of your participation in either the THHN City to Sea Ultramarathon or the THHN City to Sea Marathon event. 2. Condition of entry: you agree to abide by these conditions of entry. All entrants must be over 18 on event day. 3. Closing Date for entries will be if the event limit of 475 is met or 24/08/2018 whichever is earliest. No entries on the day. 4. Entry to this event is personal to each applicant. Once you have paid for your entry there can be no refund if you are subsequently unable to take part. Entries cannot be carried forward. 5. Transfer of an entry to another person is permitted with the organisers consent up to 24/08/2018. 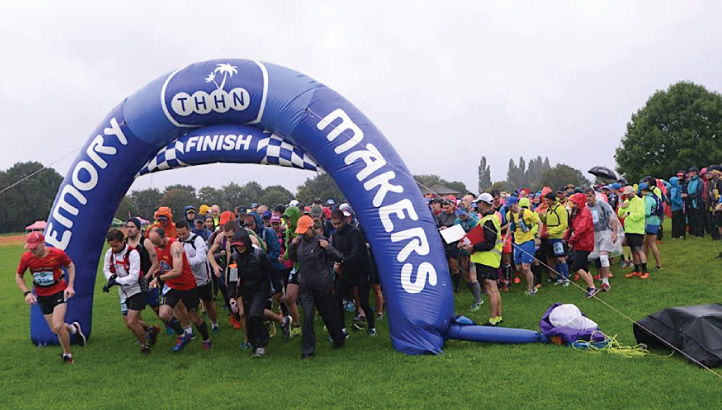 If you are unable to run and would like to transfer your place to another runner, please email cts53@thhn.co.uk and we will send you a Transfer Form to complete. There is a fee of £10 for this service. 6. Entrants to this race undertake not to take part unless they are medically fit to run either 34 miles or run / walk 26 miles depending on which route you enter. 7. We reserve the right to refuse or cancel applications, including duplicate applications, the course route or distance. If the race is cancelled or delayed, due to unforeseen circumstances an email address/mobile number will be useful in this instance. 9. Race numbers must be pinned securely to the front of your running top using a safety pin in each corner you must not cut, fold or otherwise alter the size of your race number in any way. 10. Contact and medical details: All runners are required to complete the contact and medical details on the back of their race number. This is a requirement of participation and may be checked by race officials prior to the start. 11. Timing: You must check in at each check point for your time to be valid. 12. The course: There are sections of road running and road crossings please listen to and read the safety briefing and please follow all marshal instructions on the route. 13. Safety – Headphones: In the interests of everyone’s safety, the use of iPods, MP3 players and similar is prohibited on sections of the route when you are running on the road or pavement. You will be running on the left hand side of the road during this race and we want you to be alert and aware of everything that is going on around you. It is also very important that you are able to hear clearly any verbal instructions that our race marshals may need to give you. 14. Race marshals and medical team members have the authority to disqualify and remove any runner they consider to be acting dangerously, or to be unfit to compete. 15. Runners are required to report any casualties immediately to the nearest first aid post, race director or race marshal. 16. Cut Off Times: Each check point will have a cut off time, you must leave the check point before the cut off time, if you do not leave the check point before the cut off time, you will not be allowed to continue. You can view the proposed cut off times in the event information, these are subject to change, the final official cut off times will be published on the website and will be in the race information pack. These cut off times are for your safety, please respect the marshals and race officials in this matter. 17. Wheeled vehicles, dogs or following cycles are not permitted. All competitors must compete on foot. Roller skates etc. are prohibited. The course is not suitable for wheelchairs. 18. You must have all the items listed on the mandatory kit list with you at check in and these must be carried by you along the entire route. 19. Confirmation of entry will be the debiting of entry fee. 20. Event Packs: You will receive your event information PDF containing your number and other information in the few weeks before the event. Any change of email address must be given to us as soon as possible. 21. Transport: If you have selected and paid for the transport to the start option, we will inform you of the pick up time and exact location when we send you your race information pack. It is your responsibility to get to the pick up location in plenty of time before your allotted departure time, we cannot be held responsible if you fail to do so, no refund will be given to anyone who fails to arrive before their allotted departure time. 22. Data protection: Torbay Holiday Helpers Network and the THHN City to Sea complies with the Data Protection act 1998. By entering the event you give permission for free use of your name, voice or picture in any broadcast, advertising promotion or other account of this event.